700 Arrested on Brooklyn Bridge as Occupy Wall Street Enters Third Week, Protests Grows Nationwide | Democracy Now! organizer with the main organizing group of Occupy Wall Street called the General Assembly. She is an activist and documentary filmmaker. lawyer who is part of Occupy Wall Street’s legal working group. She is also a postdoctoral fellow at the Center for Globalization and Social Change at the City University of New York, where she is researching global mass movements from Spain to Egypt. She is author of Horizontalism: Voices of Popular Power in Argentina. writer and journalist who reported on protests in London earlier this summer. She is author of the upcoming book Penny Red: Notes from the New Age of Dissent. AMY GOODMAN: Here in New York, the Occupy Wall Street protests in the Financial District took a dramatic turn this weekend when protesters tried to march across the Brooklyn Bridge Saturday. Their demonstration quickly turned into one of the largest arrests of nonviolent protesters in U.S. history. Democracy Now!’s Ryan Devereaux was on the bridge as protesters first encountered police. This is the report he called in. You have to listen closely. AMY GOODMAN: That was Democracy Now! 's Ryan Devereaux calling in a report from the Occupy Wall Street protest on the Brooklyn Bridge. Ultimately, more than 700 people were arrested by the New York Police Department. Some protesters claim police lured them onto oncoming traffic on the bridge's roadway. Others said they did not hear instructions from police telling them to use the pedestrian walkway. One of the participants in the demonstration, who gave his name as Aeron G., told Democracy Now! what he saw happen. AERON G.: What happened yesterday is, we were marching, as you know, and we were—a group of people were funneled by the police to off into the road. So, there are police up in front of us, and we were marching. So, as we were going down, we were assuming that the police were clearing the path for us to march, so they were like clearing the road, and they were up in front of us, so we were following them. And then, all of a sudden, they cut off about, like, 700 of us, and then they cut if off. And then once we got—as we were walking, we stopped, and the police were in front of us, and they blockaded us. And then they blockaded us from the back. And they were telling the front to turn around and go back, and they were telling the back to turn around and go frontward. So they were like—people were getting squished in the middle, because no one knew what to do. Then, eventually, they brought out these orange nets, and they circled us, and they just did a mass arrest on the bridge. AMY GOODMAN: The Occupy Wall Street movement, now entering its 17th day, draws inspiration from the Arab Spring. According to its website, the protest consists of, quote, “people of many colors, genders, political persuasions. The one thing we all have in common is that We Are The 99% that will no longer tolerate the greed and corruption of the 1%,” end-quote. The encampment received a boost last week when one of New York City’s largest unions, the Transit Workers Union, announced its backing. 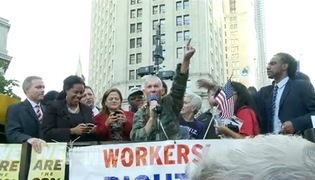 Labor unions in the city plan a solidarity march with Occupy Wall Street this Wednesday. Meanwhile, most of the 700 people arrested Saturday have since been released but were given citations for disorderly conduct and a criminal court summons. Similar “Occupation” protests have spread to other cities, including Chicago, Boston, Los Angeles, where hundreds of protesters are now camped out in front of City Hall. OCCUPY L.A. PROTESTER 1: I’m participating in Occupy L.A. I’m staying to camp here at the City Hall in Los Angeles overnight, and probably until Monday. It’s time that the top one percent is accountable for their actions. OCCUPY L.A. PROTESTER 2: Wall Street and the corporations believe that they have everybody fooled, and it’s very obvious, as you can see, as how many people are here, how many people are all over the United States, as well as all over the world, we’re not blind, and we know exactly what’s going on. AMY GOODMAN: To talk more about the protests, we’re joined by Marisa Holmes, organizer with the main organizing group of Occupy Wall Street called the General Assembly. She’s an activist and documentary filmmaker. We’re also joined by Marina Sitrin, an attorney who’s part of Occupy Wall Street’s legal working group. She’s also a postdoctoral fellow at the Center for Globalization and Social Change at the City University of New York, where she’s researching global mass movements from Spain to Egypt, author of Horizontalism: Voices of Popular Power in Argentina. And we’re joined by Laurie Penny, a writer and journalist reporting on protests in London earlier this summer, author of the upcoming book Penny Red: Notes from the New Age of Dissent. We welcome you all to Democracy Now! I wanted to start by talking about what happened on Saturday. MARISA HOLMES: Sure, so we left Liberty Plaza and then headed down toward City Hall and made our way over the Brooklyn Bridge. AMY GOODMAN: And why were you, Marisa, protesting over the Brooklyn Bridge? Why was that important to you? And how was it decided? MARISA HOLMES: Well, our direct action group have been meeting throughout the week, and they decided to go over the bridge, because we wanted to connect the boroughs, really, because we’ve been mainly in the Financial District, and we wanted to show that the crisis is really affecting boroughs like Brooklyn. AMY GOODMAN: So you started over the bridge. MARISA HOLMES: We started over the bridge, and initially, the police seemed to be OK with letting us onto the street. There didn’t seem to be a lot of presence, and people just started flooding into the street and taking the bridge. And later on, of course, we were penned in. The cops surrounded us from both sides, from the Manhattan side and the Brooklyn side, with nets, you know, the orange nets that they like to use, that they used in the RNC protests. And people were quickly kettled, but very nonviolent. No one really, you know, resisted the situation. AMY GOODMAN: And when you say “kettled,” that’s a common term now. Explain what that means. MARISA HOLMES: It means we were encircled by these nets. AMY GOODMAN: Enwrapped in—you are wrapped in the netting. MARISA HOLMES: We were wrapped in the net, so there was no way that we could move. And were also on the bridge, so it was just a very difficult situation. AMY GOODMAN: Can you talk about this issue of people who came, since there was more than a thousand people later, feeling like the police were ushering them onto the bridge, not knowing they were in violation of some order. MARISA HOLMES: Yeah, there were lots of testimonials to that effect. I personally saw the police allow us on at the front of the march, and then I fell back into the middle once we were kettled. So, yeah, I think that’s definitely true. They allowed us on and then kept us in the middle of the bridge. AMY GOODMAN: This is, Marina Sitrin, one of the largest mass arrests in U.S. history. Last weekend, the arrests included the pepper-spraying, at very close range, of people who protest. Now, the police commissioner, Raymond Kelly, has now announced an internal investigation into what happened. Can you talk about what’s going on here and what this means, as the police move in on these peaceful demonstrators? MARINA SITRIN: I mean, I think we have seen this a few times before, but it is an attempt, in our opinion as both a legal group and I think also the activist group, to intimidate people so that they don’t come out into the street. So, I mean, including last weekend, it was wrapping people in that net on the sidewalk, which is very similar to the police allowing people to walk somewhere and then wrapping them up again, so kind of giving the impression that wherever you go, you’re not safe from potential arrest. And I think it’s an intentional message to people around the country who are continuing to organize that if you go out in the street, if you go on the sidewalk, there’s really nowhere where you could potentially be safe, if you want to exercise your right to protest and to organize. AMY GOODMAN: A 13-year-old was arrested? AMY GOODMAN: Marisa, do you know about the 13-year-old? MARISA HOLMES: Yeah, I interviewed someone, actually, who—I was filming in the street, and I talked to someone who saw the arrest. This 13-year-old girl, who, you know, obviously had no prior history of arrests, was sort of caught up in the kettling. And yeah, I mean, it’s sad, because, I mean, she’ll have to deal with that on her record from now on, and I’m sure it was a traumatic experience. AMY GOODMAN: If you could talk about, Penny, putting this in a global context, what is taking place here at the Occupy Wall Street encampment? LAURIE PENNY: Well, what I found fascinating, being at Wall Street, is how similar it is to protests that I’ve seen in London over the past six months. And I’ve talked to activists from Spain and elsewhere who’ve said that this is exactly the same thing, just slight cultural differences. But it’s exactly the same: open space, non-hierarchical leadership structure, and your free kitchens, your welcoming atmosphere. It’s really, really, very similar, and it’s striking to me how much this seems to be not about America or about any individual country, but about a global uprising. You’ve seen, from below, really with no clear direction, but a kind of a defined sense that something needs to change. And of course, the reaction of the authorities is very, very similar, as well. Kettling became more well known when it was used in London over the winter. And it really is a form of collective punishment. When it was used in the mass student protests outside the houses of Parliament and in Whitehall in December and November, that’s what—those were thousands and thousands of young people, many of whom were taken out and arrested, some of whom were targeted later. And as has been said, it’s really a form of collective punishment designed to show people that they can’t come out on the streets, they can’t come out and dissent. It’s designed to deter dissent, in a age where, really, the people in power don’t have much else to offer people. They don’t have any, really, other reason to tell them not to come out and dissent. When I was marching up to the bridge the other day, I got a little chill down my spine when I heard somebody a few steps ahead of me say, “Well, they can’t arrest everyone.” And I was like, yes, yes, they can, having been in London. And that’s when I decided to leave, because it seemed like something big was going to happen. AMY GOODMAN: Can you talk more about the media coverage? LAURIE PENNY: The media coverage—again, I’ve seen something very similar to what happened in London and what’s been happening in Britain, which there’s been a lot of bias, a lot of writing off of these people as crusty hippies, students, people without jobs, which is really very untrue. I’ve been down there. I’ve met a lot of people who are employed, people who are all different ages, all different backgrounds. And everyone starts off by trying to dismiss these protesters. Then they start off by trying to demonize and criminalize these protesters, saying they’re obstructing public highways, they’re—you know, they’re making a nuisance of themselves. And then, hopefully then, they’ll really start to listen. And people have to decide what they’re going to do then. AMY GOODMAN: I wanted to raise this issue that we’ve just learned of JPMorgan Chase recently donating an unprecedented $4.6 million to the New York City Police Foundation. The gift, in the largest in the history of the foundation, it will enable the New York City police to strengthen security in New York. The money will pay for a thousand new patrol car laptops, they say, as well as monitoring software in the NYPD’s main data center. The significance of this, Marisa? The significance, sorry, of this, Marina? AMY GOODMAN: I mean, it’s very significant when you have private corporations supporting a public police force. And the same thing in Minneapolis and St. Paul during the conventions, also in Denver for the Democratic convention, but in St. Paul, during the 2008 RNC, they negotiated a special insurance provision with the Republican host committee so that the first $10 million in liability for lawsuits arising from the convention would be covered by the host committee. MARINA SITRIN: Mm-hmm, similarly in 2000 in Philadelphia with the Republican National Convention. So this is actually a pattern we’re starting to see more and more, yeah. LAURIE PENNY: It’s very interesting, the moment when you understand, as a protester or as a reporter covering protests, that the police are there not to protect everyone, but to protect a certain section of society from the rest of that society. And I think what more and more people in America today are realizing is that they are the section of society for whom the one percent, as the Wall Street protesters are putting it, are meant to be protected from by the police. The police aren’t necessarily out to protect everyone equally. That’s what people have been realizing across the world. And I think it’s very, very sad, but indicative of the problems, the massive global crisis with representative democracy. AMY GOODMAN: You’ve been covering movements, Marina, all over the world, in addition to doing your legal work. Talk—put this in that context. MARINA SITRIN: Well, it is part, as Laurie was saying, part of this global context—not just in the last two years or three years, but actually going back, I think, to 2001 in Argentina, where they had a massive economic crisis, and in response, people went out in the streets by the millions, getting rid of consecutively four governments, by banging on pots and pans. And then, rather than placing demands on, say, the government, people gathered in plazas, in work places—the unemployed gathered in neighborhoods—and looked to one another to solve their problems. And that’s something that I think began in 2001, in this form of organizing together, saying that the government, the—no one can do it for us, we have to do it ourselves, that these are the people who put us in this crisis to begin with, so we have to look to one another. So I think, beginning in Argentina—and they use that language of horizontalidad, this horizontal relationship, talking about how people relate to each other. And since then, you can see movements around the world also using this language of, “We’re going to relate horizontally. We don’t want to be like this. We don’t want people on top telling us what to do. We’re going to relate this way.” And this is all over the globe, this form of not electing of formal leadership, not having a political party, in fact rejecting all of that and looking towards horizontal forms. AMY GOODMAN: In a time when newspapers are being shuttered all over the country, it is interesting to note a new newspaper has sprung up. It is called The Occupied Wall Street Journal, named for Occupied Wall Street, and it’s main headline, “The Revolution Begins at Home.” “New York Unites! Wednesday, Oct. 5, Student Walkouts, Union Marches, “http://www.occupywallst.org”>occupywallst.org,” and it goes on from there. Marisa, talk about the unions that are supporting this protest now and the significance of the protests this week. MARISA HOLMES: Right, well, the largest CIU local in the country, 1199, has come out in support of the demonstrations, and they’re coming on Wednesday. So I think that’s a huge show of support. And because of that, other unions have joined in, including TWU. So it’s just—it’s incredible to see that the student and labor movements are coming together. AMY GOODMAN: Steel workers, as well? AMY GOODMAN: It’s interesting. We were covering one of a splinter protests that snaked its way up from Occupy Wall Street to one of the post office rallies that were being held to protect the post office, and among those who was there speaking to the post office, the postal workers, was New York Congress Member Jerrold Nadler. I went up to him after, asked him about the Wall Street protest. He said he thought it was very important and significant, the message it’s sending. Marisa, where do you go from here? MARISA HOLMES: Well, we continue to occupy Liberty Plaza, and we encourage the creation of other assemblies, neighborhood assemblies, throughout New York, and also assemblies in other cities. We’re already seeing this movement spread to places like, you know, L.A., Seattle, Austin, Boston, Louisiana. It’s really becoming a national and international movement, and it’s incredible to see. So it’s a long-term struggle. We’re not just in it for this one occupation, and we’re not going home anytime soon. AMY GOODMAN: I want to thank you all for being with us. Thank you to Marina Sitrin, lawyer, legal working group at the Occupy Wall Street protest; Marisa Holmes, New York General Assembly that organized this massive protest that’s now entered its third week; and Laurie Penny, writer and journalist, activist and documentary filmmaker. This is Democracy Now!, democracynow.org, The War and Peace Report. When we come back, the funeral of death row prisoner Troy Davis.